We all know that practicing Yoga exercises or Asanas in our daily life can offer many benefits. It improves your health, increases your resistance to diseases, gives greater flexibility and develops your mental awareness. Doing these Asanas requires you to study each exercise and execute it slowly as you control your body and your mind. Whether you practice Yoga for any purpose, the time of day can significantly influence your success. For some people, Yoga in morning may inspire but for others it may be difficult. For some people, Yoga in the evening promotes a good night sleep but for others it may energize the mind and body. Till now it is OK, but most people confuse about when to do the exercise. Yoga can be practiced in the early morning or before sunset but with empty bowels. There should be a 3 to 4 hours gap between the meals and Yoga practice. You can do Postures when the body feels stiff, tense, tired or hyped-up. Yoga is an ancient practice which brings individual into harmony with self and his environment. To achieve this state of harmony, a Yoga student must engage in structured exercises, breathing techniques, and meditation. Morning time is the best time to practice Yoga because your mind is calm, and your body has not yet undergone any stress. If you practice Yoga in the early morning, you will feel more energetic that day. 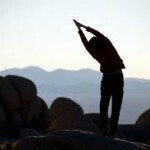 Evening time is also useful to perform Yoga exercises. Practicing at this time can help calm your body and mind after a stressful day. At this time, you have to choose slow moves which may motivate your sleep. For some people, neither morning nor evening is the time when they can perform Yoga. They can choose their own timings in a day for practicing Yoga. The success of Yoga lies in the person’s dedication, commitment, and appreciation of the practice.